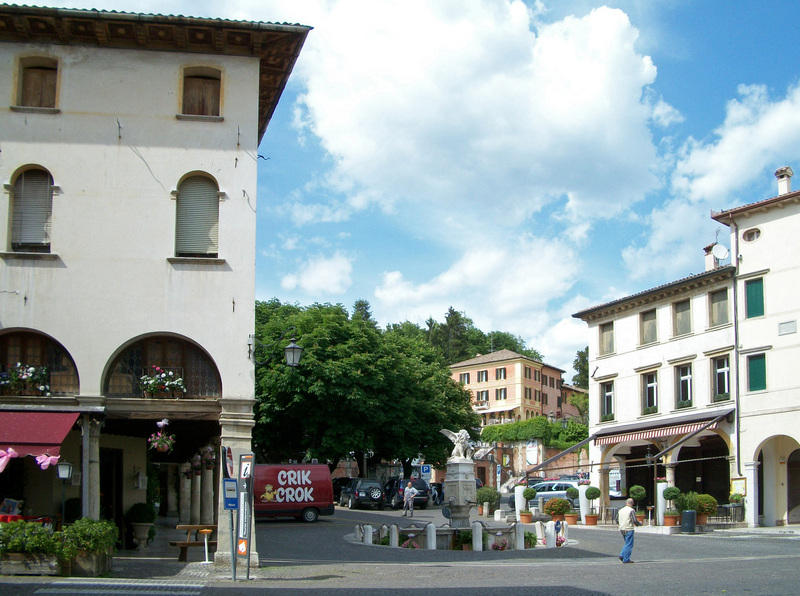 The center of Asolo, an enchanting hill town that attracts visitors from all over the world. ASOLO IN PINK…Even before last year’s Giro had begun, there was talk of a stage finish in Asolo. When its inclusion in the 2010 race route was officially announced late last year, the question on everyone’s mind was “how could they fit a Giro finish in the center of Asolo? !” Residents and merchants debated whether they would even want it there. Sure, the Giro would bring worldwide exposure and recognition, but the crowds and chaos would threaten the delicate beauty of the historic center, one of the most beautiful and renowned in all of Italy, and would not be in keeping with the genteel and cultured atmosphere. The debate was in vain, however: when the Giro logistics crew came to recce the town, they realized immediately that not only was there not enough room for all the structures and equipment, but that the streets were too narrow for the trucks that transport them to pass. The finish would have to be along the main road at the bottom of the hill, in Casella d’Asolo. However, the race would pass through the center, as well as the lovely surrounding hills, on its way to Monte Grappa, so the world would still get a chance to see how beautiful the town and area are. Since I live just a few km away, I had the opportunity to ride though Asolo several times to see how it was preparing for the big day. It is always an enchanting place, but tastefully and cheerfully decorated with rose pink flowers, garlands, ribbons, and bows, it was positively magical. On one of those occasions, a crew from a local television station was in the main piazza doing a feature story, and they flagged me down and asked if I would be willing to do an interview. I was, appropriately, wearing a maglia rosa (pink Giro leader’s jersey). On camera, I said something to the effect that I was happy that the Giro would showcase the town, surrounding hills, and Monte Grappa, an area so wonderful that I had wanted to make my home there. I was unable to watch the feature because my tv antenna no longer worked, and I forgot all about it. Three months later at the Arte e Natura festival, I ran into some friends who had seen the segment. “What a surprise! Of all people to see interviewed on tv, wouldn’t you know it would be you!” they laughed. This entry was posted in Giro d'Italia, Places. Bookmark the permalink.